This update covers a quick overview of Arizona’s financial situation, the recently enacted budget cuts and a glimpse of what is lurking in the legislature..
Arizona’s Operating Fund (the fund from which we pay our state bills) is negative for the first time since the 1930’s. Arizona borrowed $700 million from Bank of America in November. This loan was necessary to cover the Dec 1st funding for K-12 schools and to maintain cash reserves for ongoing expenses. Treasurer Dean Martin estimates that interest payments for this loan will equal about $3.1 million. The JLBC and three other economic forecasting groups hope for 6-7% growth in 2011, but even with this projected growth our state sales tax and individual income tax collections would not reach FY06 levels until at least FY2013. Corporate tax collections in FY13 are still projected to be lower than FY05 numbers. *This estimate was released prior to the latest $400 million in additional budget cuts this month. We expect the projected deficit number to be lowered somewhat in next week’s JLBC report, though probably not in a dollar-for-dollar due to increased interest payments, further declines in revenue, etc. The latest “adjustment” to K-12 education translated into a $144 million dollar cut to this current fiscal year’s soft capital funds (books, classroom materials, buses, other student supplies, etc.) The legislation exempted school districts with fewer than 600 students, so charter schools were not impacted by the recent reductions. I thought that the legislature was originally trying to cut $175 million in soft capital? Why did they choose to cut $144 million instead? In order to receive federal stimulus money, all US states had to agree not to cut education spending below their 2006 state expenditure of education, otherwise known as the Maintenance-of-Effort (MOE) requirement. This latest cut of $144 million sets us back to the 2006 number for this fiscal year. 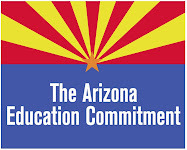 If our legislature decides to cut anything else from the overall education budget this year, Arizona would be in danger of losing the $1 billion + in State Fiscal Stabilization Fund money that we are scheduled to receive between 2009-2011. Governor Brewer is reportedly going to ask for an exemption to the federal guidelines so our legislature can continue to cut below 2006 funding levels. More on that in the ‘What’s Next’ section below. Was there any attempt at all to address our declining state revenue, tax loopholes or any other fiscal measures? No. Despite some speculation that Governor Brewer’s proposed 1-cent sales tax increase might gain some airtime in the legislature, there has been little public discussion of the measure and no serious move within the legislature to review any revenue measure, including any of the alternative plans already put forward by the minority party and outside groups. How will this impact our schools? While the $144 million reduction represents yet another financial blow directly to the classrooms, school districts had been told right from the beginning of the year that this cut was highly probable. All of the school officials we have spoken to had made ‘worst case scenario’ contingency plans for soft capital cuts this year and had not allocated all of the initial budget funds they had been assigned at the beginning of the year. That said, this additional round of reduced payments will certainly impact our classrooms. As more dollars are allocated to the most basic mandated services, many schools are already reporting that they expect to run out of their already-rationed classroom material (paper, etc.) before the end of the year. Legislators are already discussing a second special session for December, and we anticipate that leadership will meet again before the holidays. Now that the education budget is cut down to the 2006 Maintenance of Effort threshold and state agencies are shutting down offices and facilities, do you think that revenue discussions might be on the table? It’s doubtful. Plan One: Let the Lottery Ticket Buyers of 2020 Bail Us Out. The latest scheme would involve borrowing…though we can’t call it that, because the Arizona Constitution strictly prohibits long-term borrowing. To get around these silly semantic details, the latest buzzword de jour is “securitization”. Though the plan is somewhat convoluted, legislators think that they can skirt the Constitution by pledging future funds off a single source--in this case it would be the Arizona Lottery--and therefore ‘secure’ the future funds for this year’s budget rather than ‘borrow’ them. State lottery director Jeff Hatch-Miller reports that the lottery contributed $43.2 million to the state treasury last year. Legislators are looking to borrow against (er, “secure”) anywhere from 20-30 years worth of future lottery revenue….though this plan is further hampered by the fact that Arizona voters only authorized the state lottery through 2012. It’s quite a feat to dodge both the Constitution and to borrow now from a program that still doesn’t legally exist 3 years from now, but that’s the proposed plan. Legislator Judy Burges has gathered 33 majority party legislators to sponsor a voluntary donation option on the upcoming Arizona State Tax return forms. The hope is that each Arizona household would forgo some of their tax return money to help bridge the state budget deficit. Is this a viable idea? Capitol News Service reports that Arizonans donated $7.6 million to various causes (Clean Elections, veteran’s health, etc.) via their tax returns this last fiscal year. That said, even if the legislature collects a similar sum under this scheme, it would only amount to roughly .25% of our $3 billion dollar projected deficit. In other words…it’s a bit like running a lemonade stand this weekend in the hopes of covering your yearly mortgage. Plan Three: Cuts, Cuts, Cuts! Prime target this time? You guessed it – Education! At the risk of sounding like a broken record, we encourage you to continue contacting your legislators to insist that they seek a balanced, measured plan. Right now we aren’t finding evidence of a plan at all…just random cuts without much foresight into the future of our state. We also encourage you to write to local papers and TV stations. Whether you chose to write an editorial or just a simple email to a reporter, it is important to let them know that we want relevant and factual information about our state budget and that we hold education in the highest priority. Wow, these yahoos really do have their heads up their @sses! How can they not be looking at other alternatives? Arizona, it's time that we elect legislators who put the well-being of Arizona over ideology and Washington, DC lobbyists!